Pippen was Mary’s third dog guide from The Seeing Eye ®. She is ¾ yellow lab and ¼ golden retriever, which means that one parent was a golden/lab cross, and the other was 100% lab. Pippen’s personality is 100% lab. In other words, she’s all about food, sniffing, and bringing happiness wherever she goes. 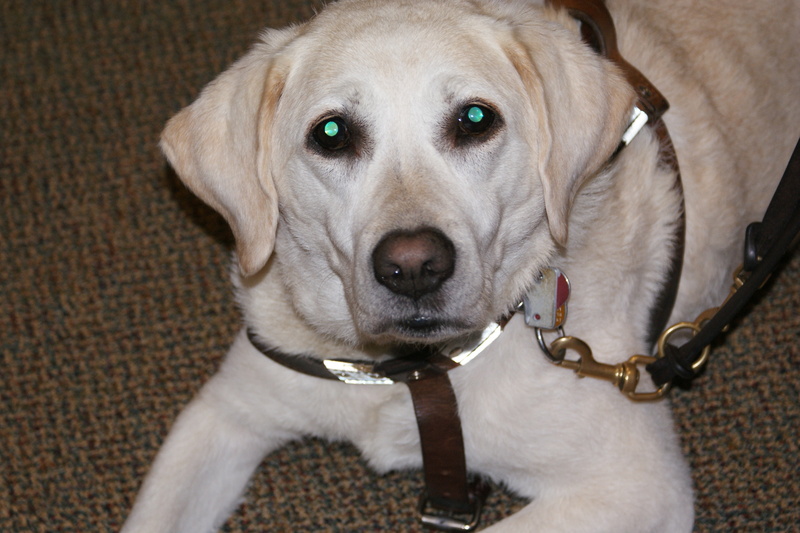 Pippen was born in 2002, learned her house manners with a “Puppy-Raiser” in New Jersey, was trained at The Seeing Eye ®, and was paired with Mary in March of 2004. Pippen and Mary had been a team for 8 years, and now that Pippen is over ten years old, she is retired. In her post, “Can I Pet Your Dog,” Mary explains what that meant for Pippen.